We often recommend probiotics in our practice. Every day, we answer questions regarding the importance of probiotics, the best brands and how and where to purchase them. There are other considerations that we would like to share with you. 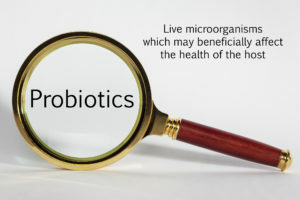 Probiotics are microorganisms that have been shown to prevent and treat illnesses. They are often referred to as “good” bacteria or bugs. Recent studies have shown that healthy bacteria not only affect our gut health, but also have broader implications in brain, mood, weight, and the immune and hormonal systems. Quality Matters. Probiotics are live bacteria, and exposing them to higher heats could damage or render them ineffective. When purchasing a probiotic make sure the company and the source are reputable. If it is much cheaper from one website (or seller on Amazon) question their handling or storage procedures. If the probiotics are stored in a non-refrigerated facility they will be destroyed and ineffective. You get what you pay for when buying supplements of any kind. Timing Matters. Taking a probiotic with food is better than on an empty stomach: it ensures a greater survival rate due to more alkalinity in the stomach. Also, studies show that taking a probiotic with a dairy medium ensures the best survival rate. Also, probiotics should be taken at a separate time from the antibiotic. Diversity Matters: Probiotics found in food sources are necessary for diversity. For thousands of years fermented foods have been a part of the diet. Unfortunately, our culture doesn’t encourage fermented foods enough. Therefore, many of us have not developed the pallet for tart or sour flavors of fermented foods that is produced by the healthy bacteria. A benefit of fermented foods is that they include a wide spectrum of strains, many of which haven’t been studied or identified. So, they naturally encourage diversity -which is one of the keys to overall gut health. When targeting a specific condition or symptom fermented foods alone are not enough and one needs to consider a probiotic. For more information on fermented foods, click here. Bibiloni, R., P. F. Perez, et al. (1999). “Will a high adhering capacity in a probiotic strain guarantee exclusion of pathogens from intestinal epithelia.” Anaerobe 5: 519-524. Collado, M. C., J. Meriluoto, et al. (2007). “Role of commercial probiotic strains against human pathogen adhesion to intestinal mucus.” Lett Appl Microbiol 45(4): 454-460. Ducrotte, P., P. Sawant, et al. (2012). “Clinical trial: Lactobacillus plantarum 299v (DSM 9843) improves symptoms of irritable bowel syndrome.” World J Gastroenterol 18(30): 4012-4018. Gilliland, S. E., T. E. Staley, et al. (1984). “Importance of bile tolerance of Lactobacillus acidophilus used as a dietary adjunct.” J Dairy Sci 67(12): 3045-3051. Gross, G., J. Snel, et al. (2010). “Biodiversity of mannose-specific adhesion in Lactobacillus plantarum revisited: strain-specific domain composition of the mannose-adhesin.” Benef Microbes 1(1): 61-66. Hojsak, I., N. Snovak, et al. (2010). “Lactobacillus GG in the prevention of gastrointestinal and respiratory tract infections in children who attend day care centers: a randomized, double-blind, placebo-controlled trial.” Clin Nutr 29(3): 312-316. Marteau, P. (2011). “Evidence of probiotic strain specificity makes extrapolation of results impossible from a strain to another, even from the same species.” Annals of Gastroenterology & Hepatology 2(1): 34-36. Paineau, D., D. Carcano, et al. (2008). “Effects of seven potential probiotic strains on specific immune responses in healthy adults: a double-blind, randomized, controlled trial.” FEMS Immunol Med Microbiol 53(1): 107-113.